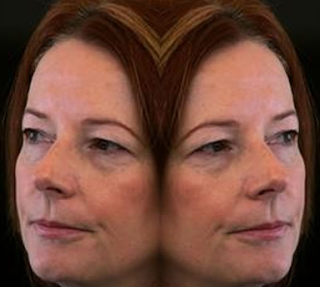 Climate Common Sense: The Two Faces of Julia. JULIA Gillard has rejected the need for Australia to pursue a nuclear-powered future while declaring the nation has much to gain from selling uranium to India. In a major backflip, the Prime Minister today urged Labor colleagues to overturn the party's ban on uranium sales to India, saying the position was "all pain, no gain" for Australia. Ms Gillard said selling uranium to the energy-hungry nation would provide an economic boost to Australia while improving long-term relations with the emerging superpower. But, as union power-broker Paul Howes urged consideration of domestic nuclear power, Ms Gillard said Australia's energy future lay elsewhere. "We have abundant energy sources so we are not in the position of a number of other nations around the world that are desperate for energy; that can see their energy needs growing and look to nuclear as a source of supply," she said. Gillard knows if we have clean nuclear fuel then her brand new Clean Energy Finance Corporation, that no doubt she will have a fat finger in sooner, rather than later, will not be required to dish out the mooted $ 10 billion to potential dodgy high risk alternative energy generation schemes that will "create green jobs"
I agree that Australia does not need nuclear power as we have huge coal and gas reserves but is it gets to a choice between nuclear and the useless "green" alternatives we should go nuclear. Someone once said that dishonest politicians were better than stupid ones - unfortunately ours are both dishonest and stupid! Everyone has an impression of people from other nations. Mine of Australians is of hard-nosed realists and formidably talented sportsmen. So watching the takeover by Greens and Climwits is dismaying to say the least since in Canada, ("A sodding big place filled with bugger all" - Denis Thatcher) Suzuki and his ilk have a very big following and I'm sure it could happen here. I have just watched a clip of Gillard saying in 2010 that there would be no carbon tax in a government led by her! Unbelievable. My sincere sympathies to you and I hope you can 'throw the bums out' soon before irreversible damage is done. "The Two Faces of Julia." There's an "r" missing. "Australia's Janus". There's an extraneous "J". When we finally get our chance, we the Aussie public will give this arrogant patronising bunch of clowns the extended stay in opposition they've been begging for. We won't forget their lies and incompetence for a very long time.